Program RspBr2 analyzes 2-dimensional beam bridges for static and moving loads under common AASHTO design specifications. The stiffness matrix analysis procedure will model linear, elastic static and traffic loads. Non-linear and dynamic loads are not considered. Horizontal curvature, skew, and lateral load effects are not analyzed by the program. Analysis results can be evaluated with pre- and post-processor programs through the simple text file interface. Both English and metric (SI) units are supported. RspBr2 considers three unique load groups—static, prestress, and moving—and handles them differently for use in load combinations. A more detailed description of the load types will follow. The sample problems may help explain the effective use of the saved results. STATIC load analysis results are accumulated using the load tag identifier specified by the user. PRESTRESS load analysis results are accumulated using the load tags PS1 (for total prestress results) and PS2 (for secondary prestress results). MOVING load envelopes are saved for truck, lane, and pedestrian loads. In addition, an envelope of the results stored in the truck or lane envelopes is available. The current versionwas developed for a Microsoft Windows XP ® standalone computer. Multiple concurrent use on a network is not supported. Bridges up to 30 spans with 60 hinges and 400 total nodes can be analyzed. Input data is from a file with free-form text commands. Output is to text files for viewing and printing. Aplain-text editor is required. 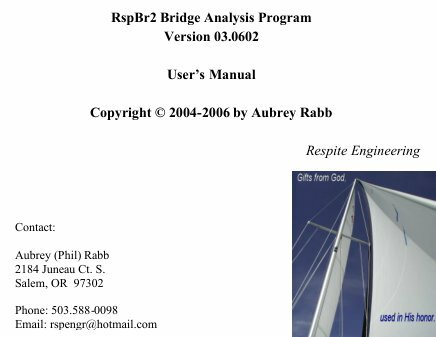 The wonderful PFE editor by Alan Phillips works well with RspBr2, and a copy is included with the program files. Since design and analysis of real bridges must be done by qualified, responsible engineers, eachapproved user must be identified to the program during installation and update procedures, see the installation instructionsin the System Manual. 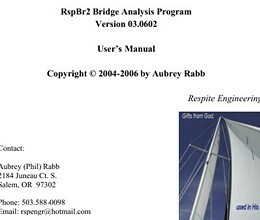 * RspBr2 download link provides alternate route open source license version of the software. No one has rated RspBr2 yet. Be the first to rate this product.